Halloween will be here before you know it and if you’d like to pick up a fun read with a seasonal theme, here are forty-eight titles in our updated 2017 Halloween Mystery List. Some have been around for ages, but others have recently been published or re-published. There are dozens more books with a Halloween theme, so if your favorite is not on the list, please let us know the title and author in the comments. Click on the bold titles to read more about the individual books. If you’ve read any books in the Halloween Mystery List for 2017, please let us know what you thought. Liz Mugavero is the author of the Agatha-nominated Pawsitively Organic Gourmet Pet Food Mysteries, a delightful series set in fictional Frog Ledge, Connecticut. She serves on the Sisters in Crime New England board and is a member of Sisters in Crime National, Mystery Writers of America, and the Cat Writers’ Association. Her brand new series, The Cat Café Mysteries, set in New England, features Maddie James and a frisky rescue cat, JJ. Liz writes the new series under the name Cate Conte. I met Liz for the first time in 2012 at Writers’ Police Academy, an annual event where mystery writers experience hands-on, how-to scenarios as demonstrated by members of law enforcement. At that time, her first book, soon to be Agatha nominated, “Kneading to Die,” had not yet been published, but as soon as it was, I was a fan for life. Who can resist an author that comes up with a plot line involving kibble on the body? Mugavero’s heart is firmly in New England. Born in Massachusetts, now living in Connecticut, and having a deep love of Maine, the affection for the area, no matter the weather or the season, comes through the pages in descriptions of the scenery and quirky, small town characters. Mugavero is a member of the Wicked Cozys, a New England based writing group whose wonderful work I have reviewed at Nightstand Book Reviews on many occasions. Each of the six women has a successful cozy series and they share writing duties on their website, posting articles about the writing life (and their own series) every week. Catch them at www.wickedcozyauthors.com. In a recent post, Mugavero spoke about the differences between the two women protagonists in her two series. 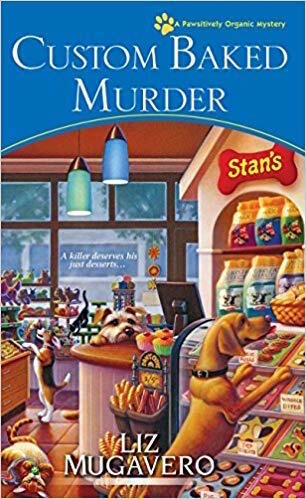 Stan (short for Kristan) Connor, from the Pawsitively Organic series, and Maddie James, from the Cat Café Mysteries, are dissimilar in several ways. Stan’s relationship with her family is always a challenge, her slow growing pet food business is a work-in-progress, and her love life is embodied in a hunk with a big, sloppy (lovable) dog. Maddie, on the other hand, has a warm, supportive, close knit family, owns a successful juice bar in California, and has two great guys who happen to catch her eye. Often. But, Mugavero/Conte writes both lead characters as gals we would like to have as friends in real-life. It’s obvious from reading Liz Mugavero’s work that she truly, deeply, loves animals. Long before penning the books, that love translated into an involvement in animal rescue. Junkyard Johnny (JJ) the inspiration for the JJ in “Cat About Town.” In the book, he seems to lead Maddie James in all the right directions to help solve the crimes. Tuffy, the inspiration for Stan Connor’s cat, Nutty, in the Pawsitively Organic Mystery series. Nutty always has a comment to make, sometimes with an imperious look, sometimes with a flicking tail. Each book in the Pawsitively Organic Mysteries includes recipes for pet food, and some of them look good enough for people to eat. There are pet food gurus behind the tasty treats, and in keeping with Mugavero’s goal to have pets eat healthier and live healthier, the recipes call for simple ingredients. In a large bowl whisk together the flour, oats, baking powder and baking soda. In a medium bowl, whisk together the applesauce, water, oil, honey and eggs, then stir in the apple and cheese. Add the wet ingredients to the flour mixture and stir until just barely blended. Spoon the batter into the muffin tins, filling almost full (you may have a couple spoonsful of batter left over). Bake for 15 to 20 minutes or until a toothpick inserted into the center comes out clean. Let cool in the tins for a few minutes and then remove to a cooling rack to cool completely. The http://lizmugavero.com/wp/for-the-animals/ section of Liz’s website includes links for pet shelters and organizations in several states around the country, along with more of the healthy pet food recipes. Mugavero’s animals snack on their healthy kitty/puppy treats, but she has her own faves. In addition to potato chips, she noshes on sushi as often as she can. Favorite flavor? Spicy tuna rolls! I discovered that Liz also writes short stories (published internationally) and magazine articles. She mentioned that she is now finishing the second ‘Maddie James’ book and then will work on book #7 in the ‘Kristan Connor’ series. More fun to come for the readers! 🙂 With the engaging leads, colorful supporting characters, and clever plotting throughout the two series, we look forward to everything Liz and ‘Cate’ write. To learn more about Kristan Connor and the book that started it all (with kibble on the body) read the review of “Kneading to Die” here. Read the review of “Custom Baked Murder,” the fifth book in the series, here. Read the review of “Cat About Town,” the first book in the new series, here. Title #6 in the Pawsitively Organic Mysteries, “Purring Around the Christmas Tree,” will be published late September, 2017. I am so looking forward to it! Photo of Edith Maxwell and Liz Mugavero by Patti Phillips. Please visit www.lizmugavero.com for more information about the talented author, Liz Mugavero/Cate Conte. “Cat About Town,” by Cate Conte, is the first book in an engaging new series, Cat Café Mysteries. Maddie James attends her grandmother Mancini’s funeral on the Massachusetts island community of Daybreak Harbor, and learns that her grandfather needs her help to save his house. A devious local developer will do anything to obtain ownership of the Mancini homestead that just happens to sit on prime waterfront property. Until he winds up dead. Under a table at the annual Food Stroll. Discovered by a green eyed, orange cat that Maddie has been attempting to befriend since she first saw him peeking from behind a headstone at the cemetery. Did Maddie's grandfather kill the developer? He certainly had motive. He and Maddie both did. Can she keep the police from arresting the two of them? The only way to prove their innocence may be for Maddie to find the real killer among the many suspects in “Cat About Town.” Can the elusive cat help? The townsfolk are an assortment of wonderfully colorful characters. In a clever piece of plotting, Conte has a Shakespeare quoting Leopard Man, a Tai Chi instructor, the donut lady, the roof guy with a mysterious money source, and more, all contributing clues to the riddle of who killed the developer. Maddie’s almost love life lights up when she chats with old/new friends about the case: the high school boyfriend who has aged quite nicely and the new fish shack owner who makes her heart flutter. Should she be having these feelings if she is going to leave town? An interesting, real-world subplot is woven into the story of “Cat About Town.” The locals fall on both sides of selling grandpa's property. The proposed project will bring jobs and more tourists to the town; so-called progress will destroy the town’s charm. Maddie James wants to help her grandfather, but while investigating the murder, the tightly layered story reveals both sides of the issue. Vacationers love the charm of old neighborhoods and big houses, but want the same amenities available as they had in the big city. It’s all about choices and zoning laws and lots of money to be made – if you know the right people. “Cat About Town,” while a neatly drawn mystery on its own, also reveals that Cate Conte really knows her cats. JJ has the scars of a street cat and the moves of a cat suspicious of people until they prove themselves worthy. The tentative paw forward, scomping down shrimp even though fed a few minutes before, and lots of other spot-on details, make JJ an endearing star in the ensemble cast that will appear in the series. It will be fun to see how Conte uses JJ’s feline sleuthing talents to uncover future clues (and bodies). And, a cat that squeaks? Adorable! Please visit www.lizmugavero.com for more information about this talented writer and her two series. Kristan (Stan) Connor is back in “Custom Baked Murder,” this time with more furry friends in residence and a love life that is heating up. Kristan is busy getting ready to open her long-anticipated pet café, with specially designed display cases, and new ideas to make both human and furry customers happy. She has two new backers for the business – one she’s happy about; the other she puts up with in order to realize her dream. Her mother, ever detail oriented and still driving Stan crazy, is getting engaged to the Mayor and the big announcement will be made at a blowout party at the groom-to-be’s house. But the Mayor doesn’t show, and Stan’s irritating former colleagues do – along with her former fiancée. Talk about cringe worthy events. Oh, and there’s the murder at the party. Certainly, a memorable evening. And not in a good way. The murder victim isn’t well-liked, so the question the police must answer is not who killed her, but instead, which one on the long list of enemies got to her first? Rumors fly and suspicions drive wedges into the small community, with several misunderstandings and family surprises thrown into the mix. Kristan must shield her mother from the press, while trying to prove her own former fiancée innocent. The overlapping story-lines are intriguing and keep the pages turning in this well-plotted mystery. Including old friends and enemies in “Custom Baked Murder” adds a delicious twist. Sometimes we hope that the oldies (but baddies) will fade away from our lives forever, or that they might have changed, but wham! There they are, creating havoc yet again when least convenient. Mugavero captures this dynamic perfectly as she delivers the multiple red herrings. Mugavero has expanded the relationships among the ensemble characters throughout the Pawsitively Organic series, evolving them in a natural way as time has passed. One gem of a character is Cyril, the reporter. Anyone who has ever met a small-town journalist will recognize the dogged chase after any detail that will make headlines. His shifts between investigation and bargaining for information are spot-on. And, then we have Stan’s hunky love interest, Jake, who keeps proving why he’s one of the good guys. The sisters have a larger role this time and fans will love that the series has become an engaging family affair. Never fear, dogs and cats play important roles, including when Kristan throws a fund-raiser for a K-9. Mugavero continues to show us ways we can help the real-life animals in our lives. Happily, “Custom Baked Murder” includes more healthy pet recipes. The blueberry biscuits look tasty enough to be people food. Don’t miss “Custom Baked Murder,” the fifth in the highly entertaining series. Read my review of the Agatha nominated, “Kneading to Die,” here. Read my review of “A Biscuit, A Casket” here. ‘Stan’ (short for Kristan) Connor leaves Hartford, Connecticut after being unfairly downsized from her high paying, high pressure PR job. It’s time to take a breather from the fast lane and move her life in a different direction. When she arrives at her newly purchased Victorian in Frog Ledge, a town so small that everybody knows your business before you say hello for the first time, she knows she is home. Her boyfriend doesn’t agree, and pressures her to get another job ASAP before she regrets her decision. Plus, he’s not happy about the commute to see her. He keeps trying to arrange job interviews for her, despite her protests. Not needed, not wanted. She has two years severance pay, after all. This pair is definitely not on the same page. As Kristan seeks to clear herself in “Kneading to Die,” she finds it hard to know whom to trust. Even her childhood friend, an animal rescuer and now the owner of Pet’s Last Chance, Nikki Manning, comes under suspicion as the case unfolds. But, then Nikki delivers some inside info about the deceased and a possible motive for the vet’s death. Colorful characters (and suspects) abound, including alpaca farmers/bed & breakfast owners, a sweetshop owner, dairy farmers, gossipy townspeople, long-lost relatives, a homeopathic vet, and more. Kristan bakes healthy treats for pets, made from scratch like people cookies, but without the additives usually found in commercial cat and dog food. One of my mother’s cats suffered with clumps of hair falling out, traced back to his completely canned diet. As soon as mom put him on a diet of home cooked fish and other fresh goodies, the condition cleared up. Mugavero is definitely onto something with this aspect of “Kneading to Die,” and has generously included recipes for dog and kitty treats at end of the book. The hunky potential love interest, Jake McGee, owns a seemingly untrainable, sloppy, big dog that loves Stan’s treats and shows up on her doorstep at odd hours, waiting to get fed. The dog keeps throwing Kristan and Jake together, at times embarrassing them both. P.S. If you’ve ever owned a cat or a dog, you’ll find the descriptions of the animals in “Kneading to Die” hilarious and spot-on. I was checking a detail at the beginning of the book and reread about Nutty’s tail delivering opinions – still sooo funny. Mugavero clearly knows her animals. “Kneading to Die” is the first book in Pawsitively Organic series, and happily, Kristan Connor will be back in the next. Please visit www.lizmugavero.com for information about this debut author.